A New Year and a New Creative You - Give Away WINNER! I'll be sending out a book to Kim who entered both by commenting on the blog and by liking the new Diversion Design page on FB. Thanks Kim and thanks to everyone who participated! I hope to be able to do this more in the future and revive this blog in a fun way! The Sketchbook Project 2011 - Almost done! It's almost time for The Sketchbook Project to be mailed off and begin it's tour around the country! Due to inclement weather nation-wide, the postmark deadline has been pushed back to January 18th, which gives me the entire 3-day weekend to finish up and get everything in order! I have had my sketchbook for a very VERY long time, but didn't like the paper, so I hesitated to start. Then I saw that a lot of people were re-binding their books with different paper, so I decided I would do that myself. However, I procrastinated. I finally got it bound with paper I liked better. I have been a sketchbooking maniac for the last two weeks! In a way, I think it's good to take a few days and that's all you do is draw...it takes time for me to find my "groove", but I definitely think I found it with this sketchbook. I think that these are some of the best things I've ever captured in a sketchbook. It really makes me think that I need to draw more regularly. Even though, because of The Doodle Swap Project, I draw a lot more than I ever have. I can see improvements in my ability to observe something and draw it more accurately and my ability to adapt what I observe to a certain style that I want to draw. When I am finished, I will scan each page and take some photographs and share them here for all of you who will not be seeing the tour. For tour dates/locations and more information, see The Sketchbook Project 2011's website at http://arthousecoop.com/projects/sketchbookproject. A New Year and a New Creative You - Give Away! Welcome to 2011. As a way to start this new year off with creative haste, I have found a lovely book to share with one lucky winner! 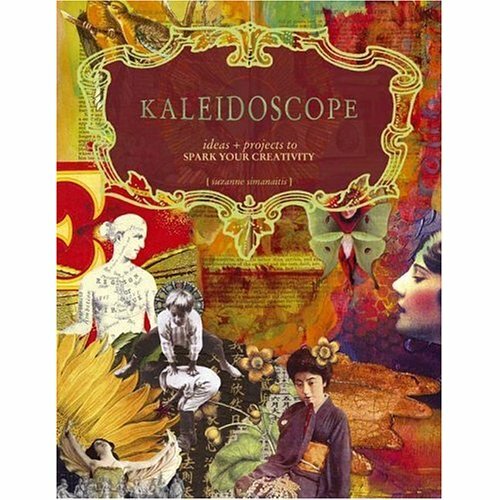 Kaleidoscope: Ideas and Projects to Spark Your Creativity by Suzanne Simanaitis is a great book to get your creative energy in high gear this year. Check out Kaleidoscope on Amazon and you can see a preview of the book on Google Books as well. There are four ways to enter to win! 1. Leave a comment here and tell me what you plan to do to make 2011 the most creative year ever. 2. "Like" my brand new Facebook page! 3. "Follow" my blog and leave another comment on this post that just says "follow". 4. "Tweet" this give away and leave another comment on this post that says "tweet". Enter by January 23rd at midnight. Winner will be selected and notified January 24th! Please make sure that I will have a way to contact you.